During a recent phone call, NRSC Chairman Cory Gardner (R-Colo.) asked the president to endorse GOP Rep. Martha McSally, widely viewed as the establishment favorite in the Aug. 28 primary, according to two senior Republicans familiar with the conversation. Trump, according to one of the Republicans, was noncommittal and did not say yes or no to the request. 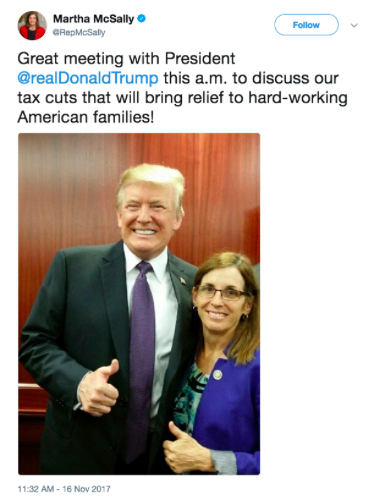 Maybe this is because McSally was noncommittal to Donald Trump in 2016, and Trump never forgets nor forgives those whom he perceives did him wrong. 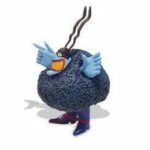 He is a vindictive man. If Trump endorses anyone, I would think it would be his loyal supporter, partner in crime and coconspirator in the Obama birther conspiracy, crazy Uncle Joe Arpaio. Trump already quasi-endorsed Arpaio with his politically motivated pardon of Arpaio. Just make it official. 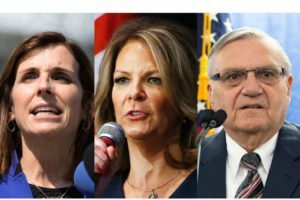 McSally is facing former state Sen. Kelli Ward and former Maricopa County Sheriff Joe Arpaio, both of whom are running as conservative insurgents. Polls have consistently shown McSally leading in the primary, but Republicans fear that if Ward or Arpaio wins the nomination, it would effectively hand a victory to the expected Democratic nominee, Rep. Kyrsten Sinema. Neither the White House nor the NRSC would comment. GOP [establishment] leaders are firmly behind McSally, who is viewed as a crucial piece of keeping their majority given that the state is one of the Democrats’ few pick-up opportunities. If Democrats win two of the three races in Arizona, Tennessee and Nevada and protect all their incumbents, Chuck Schumer would be majority leader. If Arpaio or Ward wins the primary, it would also put GOP senators in the difficult position of choosing whether to endorse those candidates. “Mythical moderate Republican” Sen. Susan Collins (R-Maine), for example, said Arizona is one of the few places she might campaign this fall for Republicans because she won’t campaign against colleagues. Sen. Collins continues to debase herself as a mythical moderate Republican. This should be her last term in office perpetrating this fraud. While Republicans are eager for Trump to intervene, the president may be disinclined to do so. He has previously lavished praise on Ward, and he pardoned Arpaio, who shares his hard-line immigration views. Arpaio had been convicted of criminal contempt in a racial profiling case and faced up to six months in jail. Both candidates are closely aligning themselves with the president, though Arpaio is trailing badly and the White House is uncomfortable with Ward promoting a photo of her alongside the president as an implied endorsement, according to the Arizona Republic. What, McSally hasn’t made the exact same pathetic move? Kelli Ward has her Martha McFake‎ website. McSally counters with the defendarizona.org website, Kelli Ward Facts. Why not settle this with a steel cage fight, no rules, winner take all? To some degree, the Democratic effort is similar to the one the party waged earlier this year in the West Virginia Senate GOP primary. During the final weeks of that contest, a Democratic group bombarded the airwaves with hard-hitting spots going after GOP Rep. Evan Jenkins, who Democratic officials viewed as the most serious threat to beating Democratic Sen. Joe Manchin. Jenkins lost, and Manchin is now leading the state’s GOP Attorney General Patrick Morrisey. If Martha McSally is the GOP establishment candidate, backed by the hated Senate Majority Leader McConnell and his nonprofit One Nation, McConnell allies jump into critical Senate primary, why would Trumpsters who want a radical outsider to deconstruct the administrative state and to disrupt the political norms as their “Dear Leader” is doing ever vote for McSally? If Trump really wanted someone who has wholeheartedly supported him he would work to get Arpaio or Ward out of the race. On the other hand maybe he hasn’t done that because he wants McSally but doesn’t have to spend political capital to get her nominated.